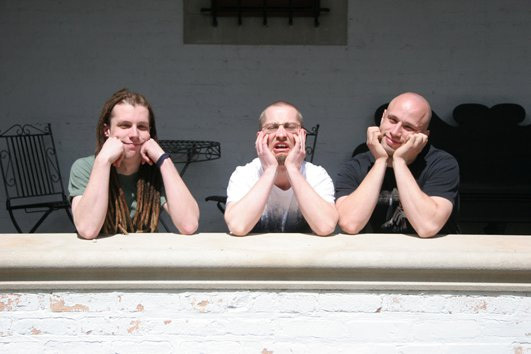 Concentric was formed a number of years ago when Jim Becker and Jerry Hauppa got tired of the extreme metal scene and desired a different expression of their musical creativity. The result was 2009's Immeasurable, a tour-de-force of technical acoustic progressive rock. The band returns as a trio, with Brad O'Malley on drums, for the electric progressive rock of V.
V is a concept album of five songs exploring the five stages of grief developed by Elisabeth Kubler-Ross in her 1969 book On Death and Dying. The fives stages are denial, anger, bargaining, depression, and acceptance. You can read more about her hypothesis at Wikipedia. The challenge, of course, for Concentric was how to communicate both the theory and the emotion of each stage in instrumental form, without a lyrical explanation. However, like Vivaldi's Four Seasons or Holst's The Planets, music can be the perfect medium to unveil and express emotions. Concentric succeed with eloquence and creativity. For example, for 'denial' there's a certain amount of lightheartedness to the arrangement, almost to convey the flittering ambivalence one might have trying to ignore the coming death experience. However, at the end, the song adds heaviness alternatively to the emotions, foreshadowing the next stage. 'Anger' is a heavy metal piece, reflecting the rage of anger that says "It's not fair!" or asks "How can this happen to me?" It's disturbing, but also an authentic audio vision of the torment a soul would face in these circumstances. Then, for the 'bargaining' stage, where one attempts to negotiate for relief, Concentric returns to a more playful arrangement. 'Depression' follows, where a person may succumb to defeat and fatalism, and, as one might expect, Concentric slows down, adding a melancholy, a sadness, to the music. Finally, for the 'acceptance' stage, there's a certain steady calmness to the arrangement. It neither extends the sadness of the previous stage nor exaggerates the lightheartedness or playfulness of denial or bargaining. It's a statement of contentment and resolve in face of the ultimate end. Once more, with V, Concentric extends the boundaries of their creativity and musicianship creating an eloquent and entertaining album of instrumental prog rock. Strongly recommended. Of note: it appears Becker and Hauppa have returned to their extreme metal roots in a new death metal band called Ara. Check out the Ara Facebook page, although there's no music to sample. 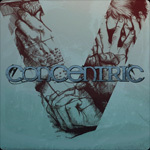 Once more, with V, Concentric extends the boundaries of their creativity and musicianship creating an eloquent and entertaining album of instrumental prog rock.